Have you ever wondered how the ancients actually set up an obelisk? 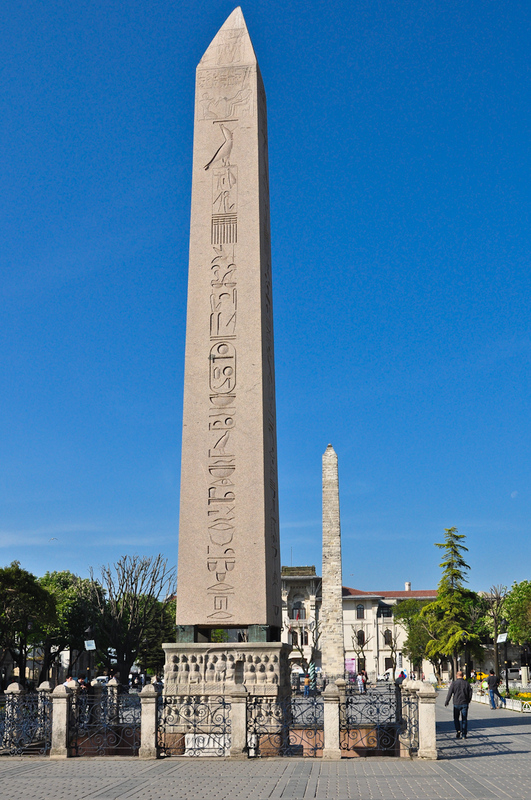 In the Late Roman/Byzantine hippodrome in Byzantium/Constantinople/Istanbul there is still standing the top third of an obelisk of the Egyptian ruler Thutmose III (r. 16th century B.C.). 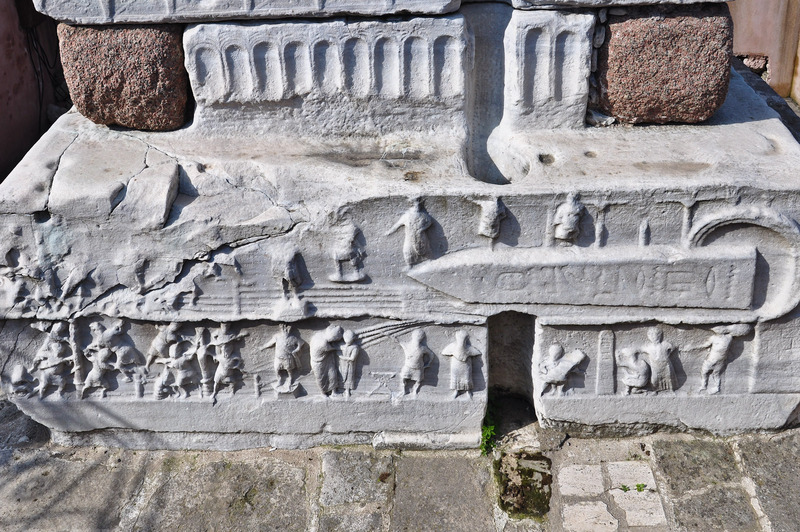 This obelisk was brought from Egypt to Constantinople and erected by the Byzantine Emperor Theodosius around A.D. 390. One of the reliefs on its marble base depicts the erection of the obelisk with the emperor and his family watching. For additional images of the obelisk and the hippodrome area Click Here. Here in the USA, the Corporation for Public Broadcasting air a 55 minute presentation of Istanbul. This progam is NOW (13 September 2018) available on the internet, but I am not certain how long it will remain available. The only well–known structure in the video is the Hagia Sophia. Included is the well–known Hagia Sophia, and lesser–known places such as the Bucoleon Palace, the Hippodrome Cistern, the Ayazam Church, the Valen’s Aqueduct, etc. I assume that this VIDEO is available worldwide at THIS LINK. NB there are three items available. Hagia Sophia in 3D (3 min)— this did not impress me at all and seems to be poorly done. On airline flights I can typically put up with any seat assignment for 1 to 4 hours. However, when I found out that on our one hour flight from Istanbul to Denizli (Turkey) that my wife and I were assigned seats in the second row from the back of the plane (window/center), near the lavatory, I was less than happy. But, as we settled in, I noticed that the sky was clear, the window was relatively clean, and that there was no wing to block my view of the ground! “Heh Mary, hand me my camera!” Now all I needed was for the pilot to take the “right” flight path out of Istanbul on our way to Denizli. Well, he/she did! 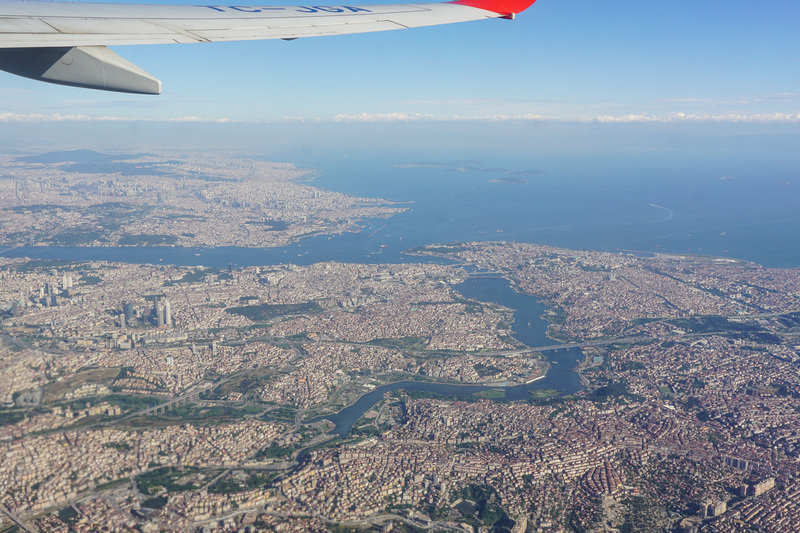 And we flew just west, then north, and then east of the Bosporus—and I was on the “right” side of the plane to see/photograph everything! My dreams had come true!! Here are a few images that I took on that flight. View looking south southeast over Istanbul. In the upper right of the image is the Sea of Marmara. The landmass in the lower portion of the image is European Istanbul. The land mass in the upper left is Asian Istanbul. The Bosphorous/Bosporus Strait separates these two continents. 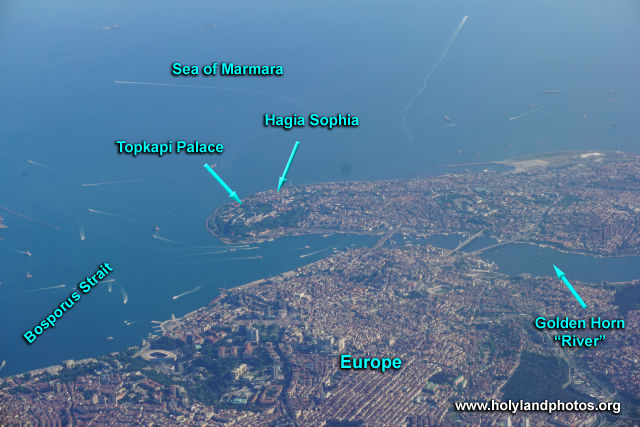 The meandering “river” in the lower center of the image is the “Golden Horn” (river) that “flows” into the Bosporus. There are four bridges over the Bosporus—faintly visible. 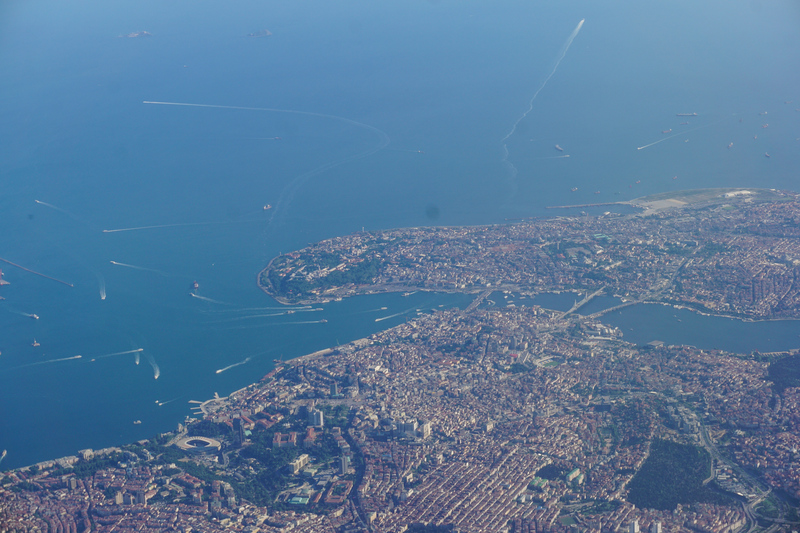 In the upper portion of the image is the Sea of Marmara. The water on the left (east) side of the image is the Bosporus Strait. 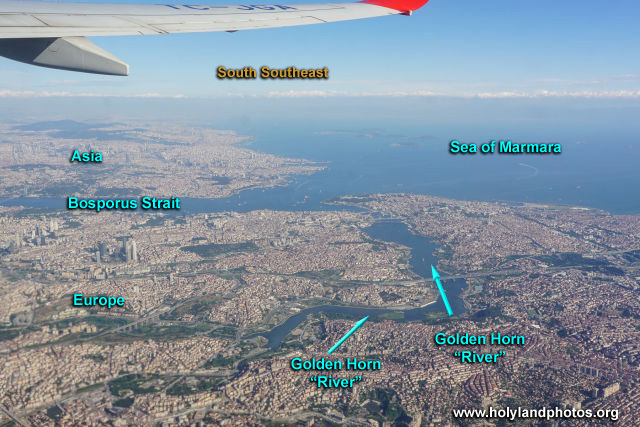 The “Golden Horn” (river) “flows” from right to left in the center of the image—entering the Bosporus. Note the three bridges that span the Golden Horn. The landmass in the image is European Istanbul. To view additonal images Click Here. Suleiman the Magnificent was the most powerful ruler during the long period of the Ottoman Empire (ca. 1517–1917). He died in 1566 and was a contemporary of Luther (d. 1546) and Calvin (d. 1564) and was the builder of the walls of Jerusalem! View looking north northwest at the Türbe of Süleyman that houses his cenotaph and those of his daughter and two later sultans: Suleiman II and Ahmet II. All total, it houses 8 cenotaphs. Click on Image to Enlarge and/or Download. This structure was designed by the famous architect Sinan and was completed in 1566, the year that Suleiman the Magnificent died. Note the porch that surrounds this octagonal structure and the slender columns that support it. View looking at the cenotaphs in the interior of the Türbe of Süleyman. Click on Image to Enlarge and/or Download. 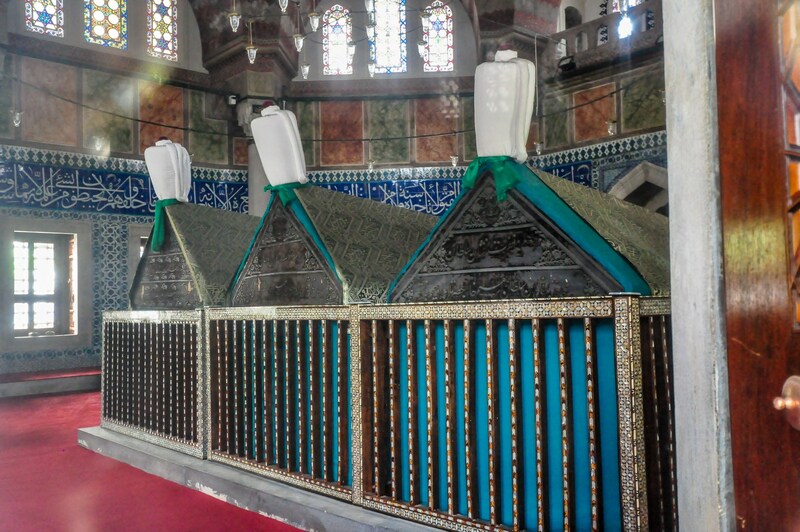 Besides Suleiman’s cenotaph there are those of his daughter and two later sultans: Suleiman II and Ahmet II. Looking at the walls, from bottom to top, note the Iznik tiles, the Arabic freeze, the marble paneling, and the colorful glass windows. The “Suleymaniye” is a mosque complex that was built between 1550 and 1557 by the famous architect Sinan to honor and house the remains of Suleiman the Magnificent (ruled 1520 to 1566). 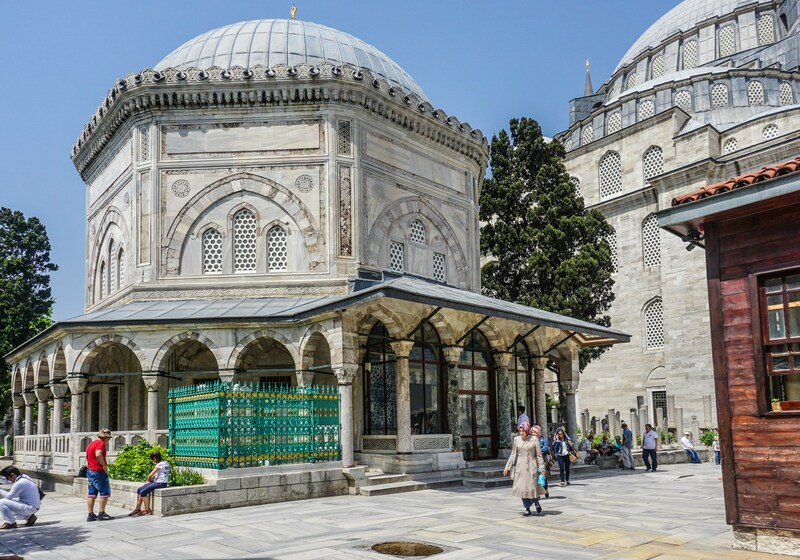 The complex (Turkish külliye; ca 18 acres in size) consists of the famous mosque, schools, a hospital, a hospice, a “soup kitchen,” a Turkish bath, and the tombs (Türbe) of Suleiman, his wife Roxelana, the architect Sinan and others. 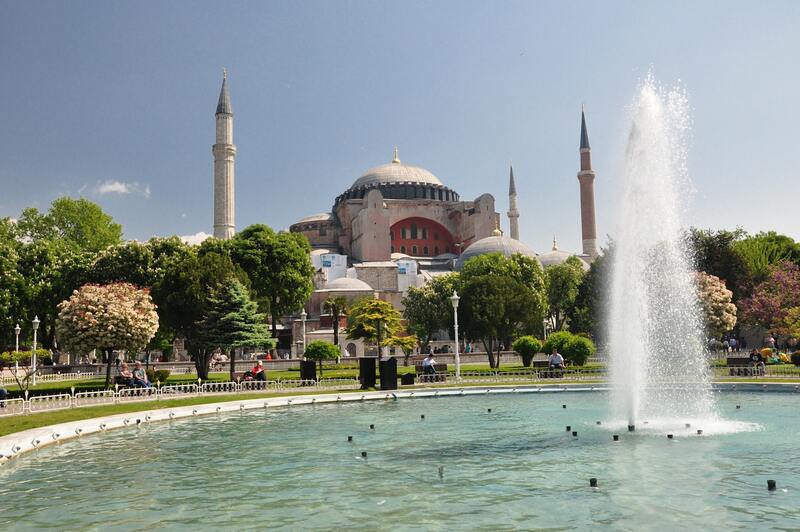 For almost 1,000 years the Hagia Sophia in Istanbul was the main church of the Eastern Roman Empire (Byzantium). It was converted into a Mosque in 1453 and in 1935 it opened as a museum. 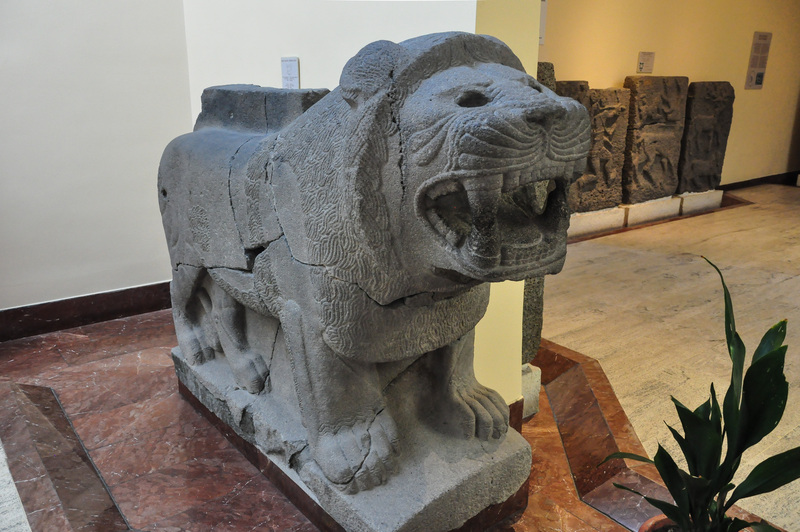 As a “museum” no “services”—Christian or Muslim—are to take place in the building. But would it not be interesting to hear the sounds of a Christian service in the building? Well, you can! For a group has produced the sounds of a Christian liturgy from the Hagia Sophia—but not in the building itself. What? To find out how they did this, along with samples of the liturgy, check out the following 5:00-minute video. See some descriptive commentary Here. Visit All of Turkey in 2 Hours? On a recent visit to Turkey, my wife and I had a few extra days in Istanbul and we decided to visit a place that we had never been to before. The place is called Miniatürk Park and is located about a 35-minute bus ride northwest of the bridges that cross the Golden Horn. 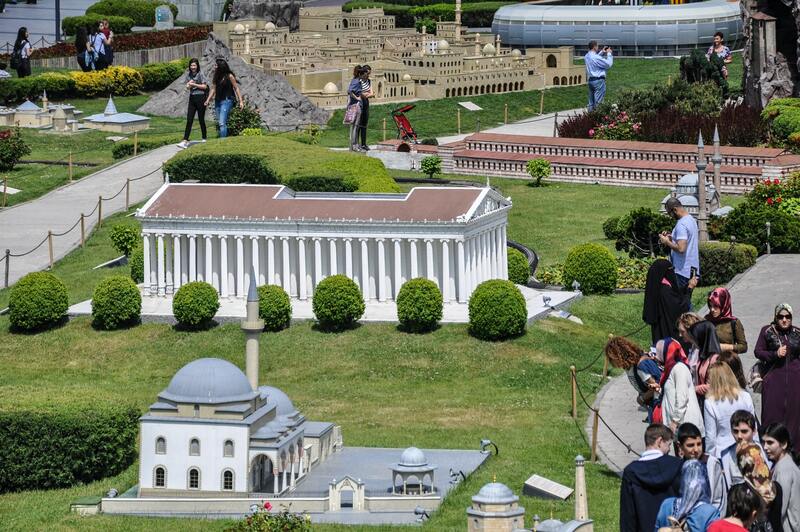 A general view of one area of the Miniatürk with people—for perspective. In the center is a model of the Temple of Artemis at Ephesus, below it a mosque complex, and above it to the right, the long red building, is the Church of Mary at Ephesus. 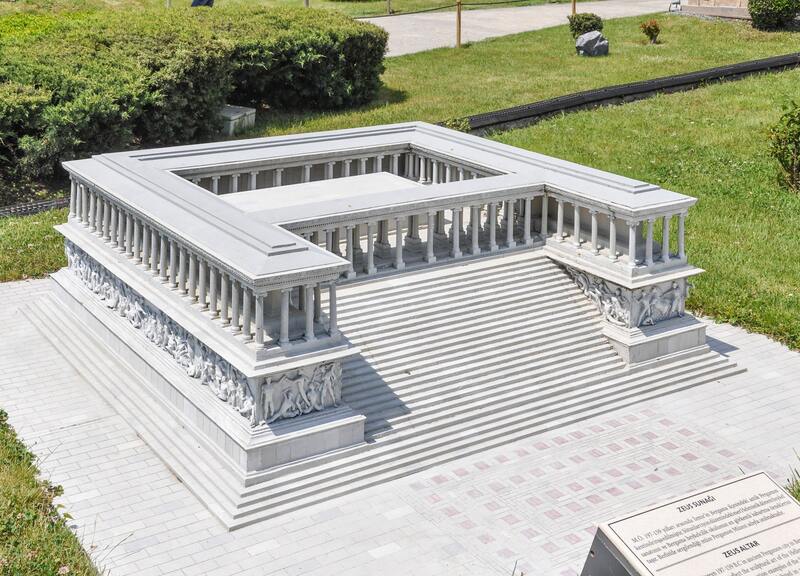 Miniatürk is a 15-acre site that displays 1/25 scale models of 131 structures found mainly in Turkey. Sixty–one models are from Istanbul, 58 from Anatolia, and 12 from outside of Turkey. The time periods represented are from earliest times up to the present. By way of comparison, the model of Second Temple Jerusalem at the Israel Museum is on a 1/50 scale. There is a wonderful Panorama of the Park at the end of this Post! Several examples of the models follow. View of the Süleymaniye Complex in Istanbul that features a large mosque with four minarets that was designed and built by Sinan, the architect of Suleiman the Magnificent. Note the three structures this side of the mosque. The structure closest to the mosque is where the Tomb of Suleiman (builder of the walls of the Old City of Jerusalem) is located. The one in the middle is the Tomb of his wife Roxelana. The structure on the wall is the Dal–ül Kuran—a place where the proper reading of the Koran was taught. View of the famous Zeus Altar that was discovered at Pergamum (the Throne of Satan?). 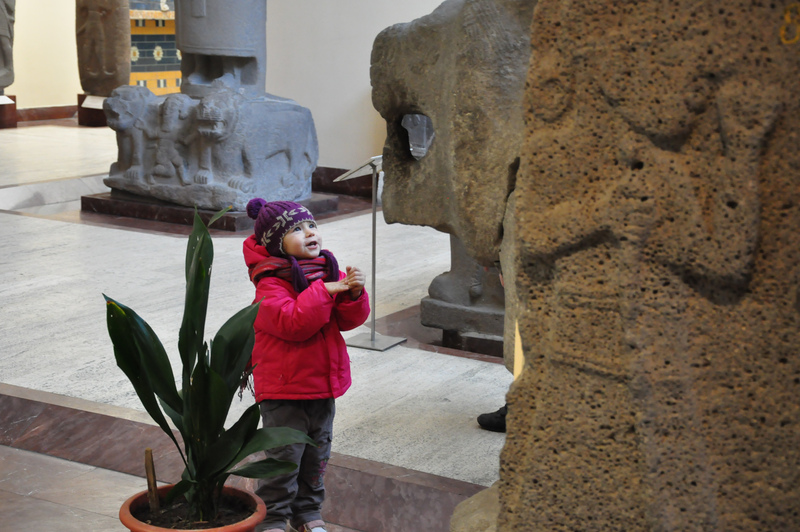 To see the altar of Zeus as reconstructed in the Staatliche Museum in Berlin Click Here. The altar is rectangular in shape measuring 118 x 112 ft. [36 x 34 m]. To view the site of the altar at Pergamum Click Here. To appreciate the full vista of the Panorama, click twice on image and scroll right and left. The image is 3,000 pixels wide! 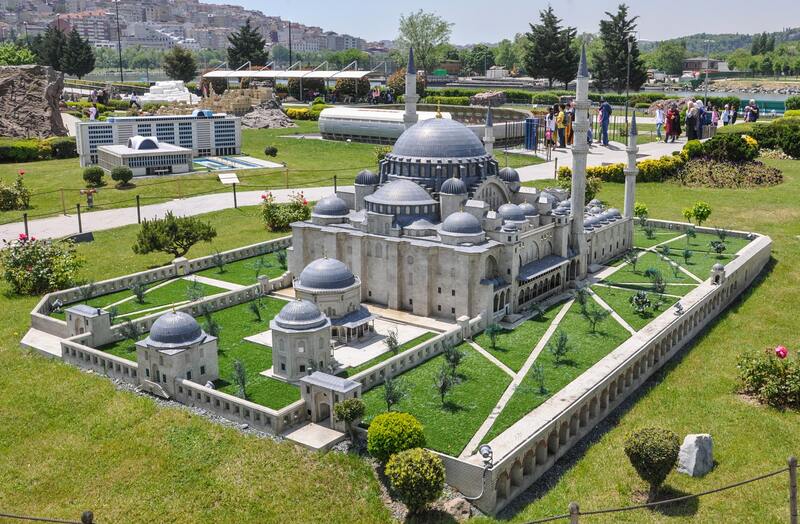 Note the people walking around the 15-acre site that displays 1/25 scale models of 131 structures found mainly in Turkey. Sixty–one are from Istanbul, 58 from Anatolia, and 12 from outside of Turkey. The time periods represented are from earliest times up to the present. To view additional images from Miniatürk Park Click Here.